Wait, you want to know more about this Kickstarter project before pledging? The premise of Dreadline is that, having fallen in with a gang of time-travelling monsters, Ghost, an 8-year-old boy with a sheet over his head, is wanting to sate his companions blood lust in the most ethically sound manner. He leads the band to locations in history that are moments before a terrible demise -the Titanic moments before it crashes and the city ofPompei on the eve of the volcano’s eruption are two examples developer Eerie Canal provides – and slaughters everyone in sight. Blending the ARPG genre with some tricks from the RTS field, you’ll be taking a team of four monsters (Ghost and three companions) to each locale and solving puzzles, killing innocents, and collecting hearts. While this is Eerie Canal’s first game, the studio is headed by Bryn Bennett and Steve Kimura, who, between them, have worked on classics likeSystemShock 2, Titan Quest, and Freedom Force. The influence of which can be seen in the dark comedy and game styles. They’re looking for $167,000 in funding to get the game shipped in August and they’ve already been working on the game for a year using their own money. 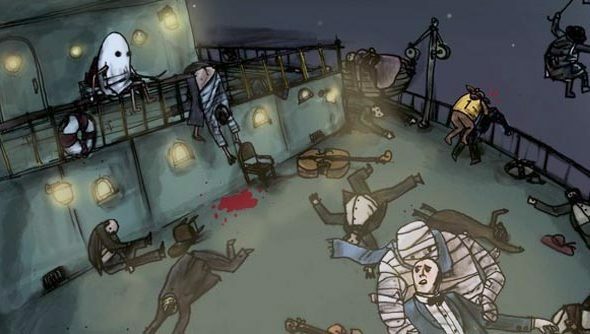 As ever, there are a number of stretch goals – various ports, multiplayer, new characters, and events – but the current plan is to ship the violent romp with nine monster companions to choose from and seven disaster scenes. There are currently three monsters in the game, besides Ghost, and if the other six are anything similar it should make for a unique cast of characters: a chilly mummy that pops off heads by hugging people tightly, a teenage werewolf, and a terrible… cube. You can learn more about the project over here.